A new UK based Kickstarter project kicked off five days ago and has already raised more than double the initial funding goal of £30,000. The project is for the NFC Ring, as in a wearable ring for your finger. This modest piece of wearable tech may be useful and decorative jewellery for some, yet is to be made available for only £25. Near field communications (NFC) is being built into more tech and devices so such an easy and convenient 'key' might be even more handy in the future. 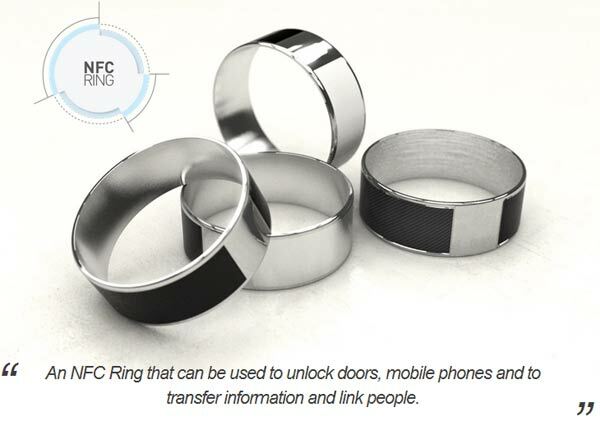 The NFC Ring is wearable tech that can unlock mobile phones, transfer information and even unlock doors. It requires no charging or updates and is basically as fuss free as you want it to be. The rings have two NFC chips built into them, a public one and a private one. It is intended that the user faces the public data ring outwards and can share such NFC data with a fist-bump or closed hand. With your hand open, and the inner smaller NFC chip section exposed, you can share more private data and unlock your personal NFC enabled devices and gadgets. That sounds simple and intuitive. The NFC Ring Kickstarter page details the development headaches and solutions found and how the NFC became what it is today. In the future an open source software platform to give easy access to the NFC Ring may bring along more apps which make use of it. As jewellery is a personal thing and people have different taste, the NFC Ring will be made customisable and even 3D printable in your own designs. The British designer of the NFC Ring, John McLear, has made 3D models that you can modify freely, available on Github. The Kickstarter fundraising effort was re,quired to pay for the initial mass produced order; a minimum of 10,000 units of the custom NFC inlay is one of the manufacturing requirements. As the Kickstarter project is already successful the estimated delivery of rings by the end of October should be achievable. Also several 'stretch goals' have been sprinted past with the project now approaching £75k in backing. At £100k there will be five colour inlay options implemented (white, black, black carbon fibre, silver, wood). This project was discussed on the latest “All About Android” podcast (http://twit.tv/show/all-about-android/119 at around 20m 40 secs in). Not sure whether I want to pony up some money for this or not - could this become geek chic? Shame that NFC isn't more widespread - e.g. of the four phones in this house there's only one that is NFC-enabled. And of course, at the moment the vast swathe of iPhone users can't use this ring - at least without some kind of extra NFC sensor being added. my low tech non nfc keys and hands can also unlock doors with fairly minimal delay too. there is such a thing as too much technology. This is another one of those things where someone sees a technology and tries to create a problem that we apparently have to be solved by it. Kinda like the idea for unlocking my Nexus 4, I've always thought that a 4 digit pin wasn't enough (too easily shoulder surfed) so I use 6 and it just gets a little tiresome when you're sleepy, drunk, running etc. Would be nice if it just “knew” my hand somehow… a fingerprint reader on the back of phones would be awesome, but probably impractical. The only problem I foresee if they became too prevalent is that thieves would have to demand your ring too rather than just grab the phone and run, which might lead to more violent muggings… probably won't ever get THAT popular though!